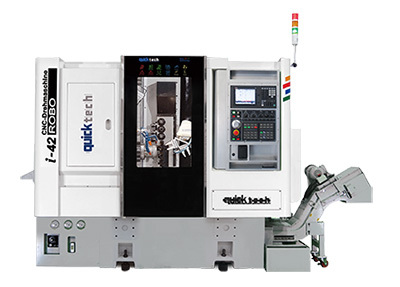 This 4 axis lathe with C-axis and live tooling provides the added advantage of robotic loading for unmanned chucking operations. This machine is a modified version of the IT-42 with internal integration of a Mitsubishi 6 axis articulated robot. This requires no additional floor space, and is positioned so it will not hinder the machine operator while setting the machine, or operating the Mitsubishi M70 control system. 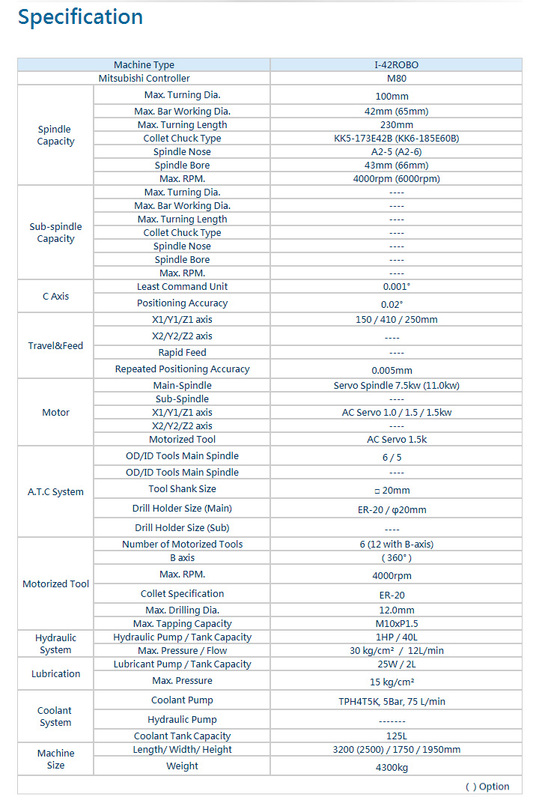 Complimenting the standard IT-42 lathe, is a fully integrated high speed, high precision 6 axis robot. This intelligent robot has a total of 88 programs, and can easily maneuver around tooling and other obstacles within the work area. It can handle work pieces of up to 6kg, and is ideal for billets, castings and forgings. The machine is equipped with high precision, HIWIN linear guideways. The use of 35mm rails throughout the machine increases stability and accuracy, and allows heavier cuts to be achieved.